LatinaLista — On the tenth annual Endangered Species Day, the world’s focus is saving one little winged creature that for a few months out of the year is the unofficial goodwill ambassador that unites Canada, the United States and Mexico — the Monarch Butterflies. The one food source for monarch butterflies, the milkweed, is disappearing. And as the milkweed disappears, so do the monarchs. The world isn’t ready for this fragile beauty of nature to disappear and so there’s a national effort underway to help replenish the plant’s growth. Appealing to people to take the time to build a “milkweed seed bomb,” conservationists are ensuring the future of the monarch butterflies can be enjoyed by future generations. And that’s the idea behind saving endangered species. In the past, there have been animals, insects and plants that would have died out if it were not for the hard work of conservationists. Not all of the endangered species are cuddly, beautiful or harmless creatures but their absences in our ecosystem would have profound effects and ongoing consequences no one could imagine. Unfortunately, it’s hard for the average person to know which species is endangered — let alone remember that an Endangered Species Day even exists. For that reason, the World Wildlife Fund has launched an unique campaign that not only raises awareness about endangered species but gets people to willingly share it on social media and raise money at the same time. 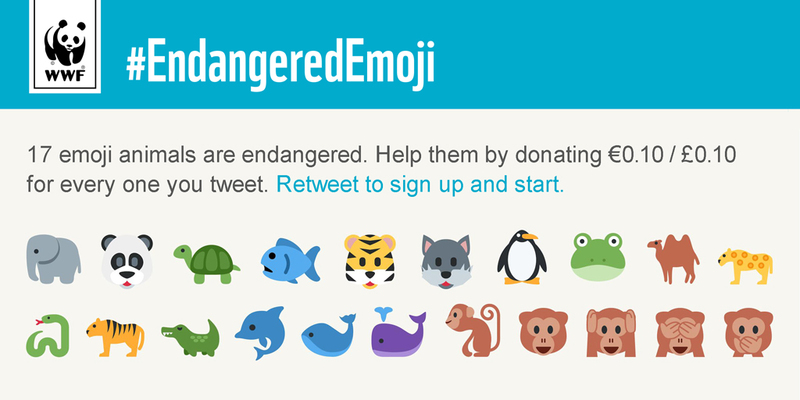 The #EndangeredEmoji campaign is built around something that people already like to do on social media — share images of cute animals. Emojis of 17 different animals, from the familiar Giant Panda and Blue Whale to the lesser known Siamese Crocodile and Bactrian Camel, populate the list of animals currently under threat of existence due to climate change, destruction of their habitats, poaching or natural disasters. To get started, a simple retweet of the campaign message lets a user enter the campaign. Afterwards, whenever the user uses one of the emojis in a tweet, a donation of EUR 0.10/GBP 0.10 will be applied towards the cause.